In military aviation, a wing is a unit of command. In most military aviation services, a wing is a relatively large formation of planes. In Commonwealth countries a wing usually comprises three squadrons, with several wings forming a group (around 10 squadrons). Each squadron will contain around 20 planes. Air forces of NATO member countries which use the term 'wing' to denote their main formations include the Spanish Air Force (Ala), the Hellenic Air Force (πτέρυγα [pteryga]), Royal Norwegian Air Force (luftving, Norwegian for air wing), Royal Danish Air Force (which adopted the English term wing directly, although the Danish word is vinge), the Belgian Air Component (also adopted the English term wing directly), the Polish Air Force (skrzydło) and the Slovak Air Force (krídlo). Additionally countries influenced by the US in the building of their modern air forces also use the term wing. Several such examples are the Republic of Korea Air Force, the Japan Air Self-Defense Force, the Royal Thai Air Force, the Philippine Air Force, the Peruvian Air Force, the Venezuelan Air Force, the Ecuadorian Air Force and the Brazilian Air Force. In the British Air Training Corps, a wing consists of a number of squadrons within a designated geographical area, usually named after the county in which it is based. In this context, a wing is inferior to a "region" which is made up of six wings. In all, there are 36 Air Training Corps wings in six regions within the United Kingdom, each of which is commanded by a RAFVR(T) wing commander. 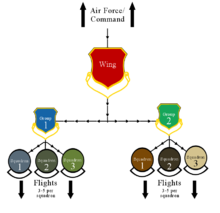 By comparison, in the United States Air Force, a wing is normally the organizational tier below a Numbered Air Force. Most USAF wings are commanded by a Colonel, but some are commanded by Brigadier Generals. USAF wings are structured to fulfill a mission from a specific base, and contain a headquarters and four groups: an operations group, a maintenance group, a medical group and a mission support group. Such a wing is referred to as a Combat Wing Organization, which is comparable to a brigade in the US Army. Other wings, such as Air Expeditionary Wings, exist for various other purposes, and their scope may extend to one base, one theater or worldwide. In United States Air Force usage, a military organization above a squadron level (group, wing, air division, numbered air force, air component command, Major Command (MAJCOM)) is an establishment, while that of a squadron and lower (squadron, flight, detachment) is a unit. "Constituted combat wings are always numbered in a single series beginning with Arabic "1st". Examples: 1st Fighter Wing, 21st Space Wing, and the Strategic Air Command's 509th Bomb Wing. All constituted wings have one, two, or three digits in their numerical designations. In the Civil Air Patrol, there are 52 wings (each of the 50 states plus Washington, D.C. and Puerto Rico). Each wing supervises the individual groups and squadrons in that state, district or commonwealth, which are the basic operational units of the organization. Some wings, for example Delaware Wing, have only one group due to the small geographical and manpower size of the wing. The United States Navy follows the British structure in that a Wing is an administrative formation commanding two or more squadrons of aircraft that are based on land. Several Wings are combined into a Naval Air Force. The several wings assigned to each Fleet Naval Air Force control the wing's type squadrons. A Carrier Air Wing (CVW, formerly known as a Carrier Air Group) consists of several squadrons and is an operational formation that is based on an aircraft carrier. The squadrons of a CVW are also assigned to administrative type wings (such as Strike Fighter Wing Atlantic). Naval Air Forces are commanded by either a Rear Admiral (Upper Half) or a Vice Admiral and wings are commanded by Captains, with the title of Commodore. Carrier Air Wings are commanded by either a Navy Captain or a USMC Colonel with the title of "CAG" (Commander, Air Group), a legacy title from the former Carrier Air Groups. In the United States Marine Corps, a Marine Aircraft Wing (MAW) is an overall command, equivalent to a Marine Division, consisting of at least two Marine Aircraft Groups, a Marine Air Control Group (MACG), a Marine Wing Headquarters Squadron (MWHS), and a Marine Wing Headquarters (the Wing Commander and his staff). Being equivalent to a division in size, its commander is usually a Major General. Unlike their USAF counterparts, all USN and USMC air wings are tenant activities ashore and have no command responsibility for the installation at which they are normally based when not afloat of forward deployed. Naval air stations and Marine Corps air stations (and facilities) have separate commanding officers that are independent of the operational wing structure. Many mission support functions on these installations, such as personnel support and medical/dental facilities, are also independent of both the air wing and air station command structures and are independent tenant commands with their own commanding officers or officers-in-charge. In other languages, equivalent air force units equivalent to a US wing include: Geschwader in the German Luftwaffe; Aviatsionniy Polk (Aviation Regiment) in Russia; Stormo in Italy; and escadre or régiment in the French Air Force. (Escadre is also the official Canadian French translation of wing in the Canadian Forces.) The French Escadre and the German Geschwader originate from the naval term Squadron. A similar formation in the Swedish Air Force is the Flygflottilj, which translates in English as Air Wing (literal meaning is Air Flotilla or Flight Flotilla). Among the NATO member countries the Turkish Air Force (Ana Üssü, Turkish for main base) and the Bulgarian Air Force (авиобаза [aviobaza], Bulgarian for air base or aviation base) use the term air base for their main formations. These air bases are brigade-equivalents commanded by Brigadier generals unlike the air wings of other NATO members, which are regiment-equivalents commanded by Colonels. The Royal Netherlands Air Force (vliegbasis, Dutch for flight base or air base), the Portuguese Air Force (base aérea), the Czech Air Force (základna letectva, Czech for air base or aviation base) and the Croatian Air Force (zrakoplovna baza, Croatian for aviation base) use the term air base for regiment-equivalents commanded by Colonels in a direct paralell to the wings of other member states. The World War II German Luftwaffe Geschwader and Gruppe were similar to the wing and group of the United States Army Air Forces of the same era. ^ "Command Development_P". Archived from the original on 2014-07-14.